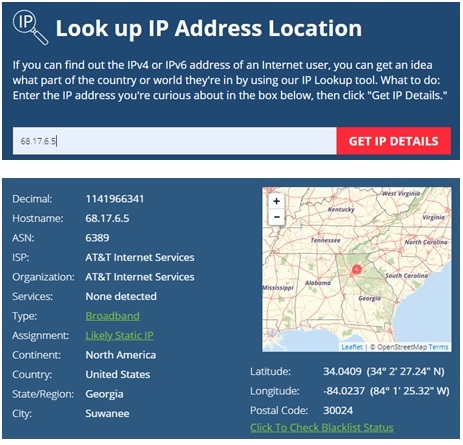 IP lookup (might refer it to trace IP sometimes) is useful to provide you additional information on the user, ISP, country or even detailed location of the IP address. This can be very useful if your network is being probed by others and you know that culprit’s IP address, or find out where those spam emails came from by doing lookup on sender’s IP address. This website also states that: the geographic details are pulled from a commercially available geolocation database. Geolocation technology can never be 100% accurate in providing the location of an IP address. When the IP address is a proxy server and it does not expose the user's IP address it is virtually impossible to locate the user. The country accuracy is estimated at about 99%. For IP addresses in the United States, it is 90% accurate on the state level, and 81% accurate within a 25 mile radius. Our world-wide users indicate 60% accurate within 25 miles. Return to top of "Quick Way to Do IP Lookup"! !